Good company and delicious food are two things that can make even the greatest hardship a great experience. Marissa and I have been on some trips that at times needed a silver lining. With long buggy portages or paddling into the wind for 3 hours on Georgian Bay, we need happy thoughts to get us through. Nothing beats a hot pot of chilli and warm bannock for dipping and cleaning the plate! So here is one of my personal favourite camp foods: Bannock. Bannock is very packable and keeps well as long as it stays dry. It's made up of all purpose flour, baking powder and salt. It doesn't require kneading and can be made in minutes, either in a pan or even wrapped around a stick over an open fire! I don't do much baking at home so I rarely use flour or baking soda. 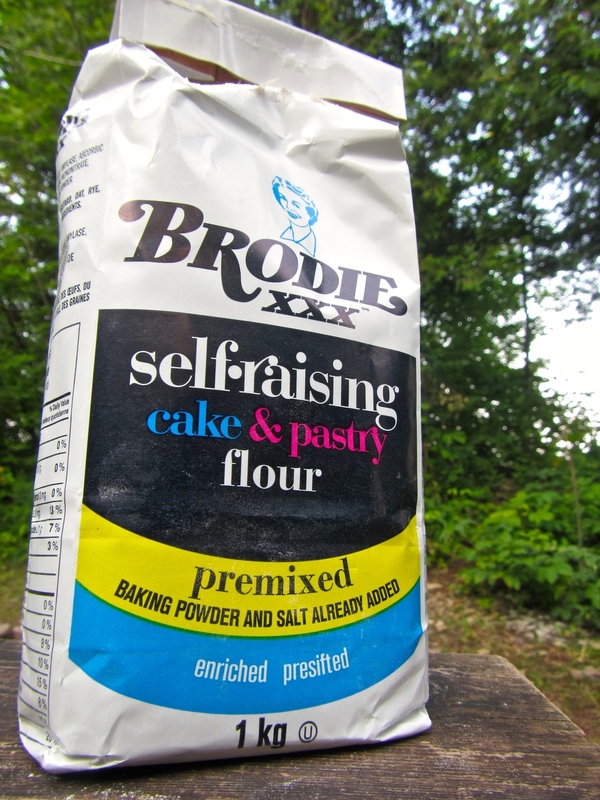 For this reason and to keep things as easy as possible, I use a premix to make my bannock, Brodie's Self Rising Cake and Pastry Flour. This mix works perfectly and saves you time. Pack what you'll need for your trip in a freezer bag. I like to double bag when possible. Once you have the mix, all you need is water and a form of fat if you're cooking it in a pan. Place Brodie's mix, cheese and garlic in a pot or large bowl. Slowly add water while stirring until the flour becomes one whole sticky mass. In a pan, heat the fat. If you make bacon for breakfast, use the fat or you can use lard, oil or butter. Once the fat is hot, carefully push the dough into the pan with a spoon. Medium heat works best. Keep an eye on the dough until the bottom turns golden brown. At this point, you can use a spatula to flip it over. If you prefer, flip it onto a plate and slide it back into the pan. Once the second side turns golden, you can remove it from the heat and let it rest for a couple of minutes on a plate before serving. Traditionally bannock is torn and not cut. So tear off a hunk and if you have butter or margarine, it makes it even yummier! My personal favourite calls for left over pieces of sausage or bacon and some chilli flakes. But it doesn't end there. The possibilities for bannock are endless! Remember - Bannock is not just for camping trips. It's great to make at home too! Enjoy!